This colorful beauty is READY TO SHIP! Perfect for any unicorn or pink/purple party! You will get this exact piece. Rock out with your hawk out and feel like a God/Goddess in your one of a kind, ‘MADE JUST FOR YOU feather mohawk!!! HOW CAN I CUSTOMIZE MY FEATHER MOHAWK? 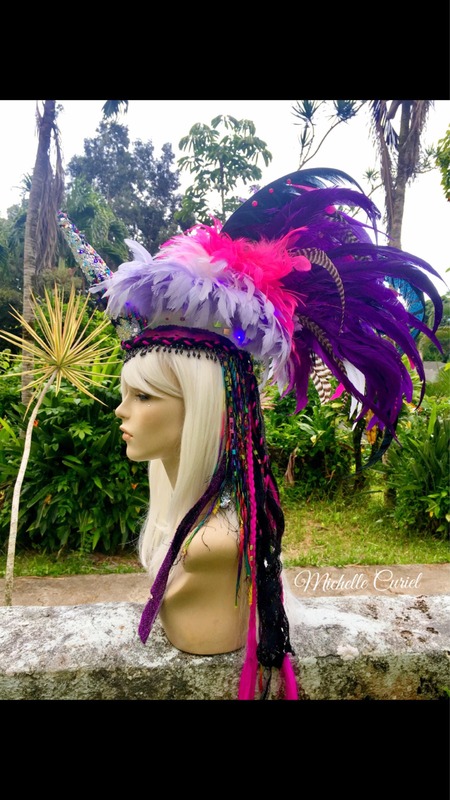 Each one is made to order so please specify what feather accent colors you would like in the front of your mohawk ****if you do not contact me on what customizations that you want I will make your mohawk to be as similar as possible in the first photo of this listing****. There are short and long feathers, so you have the option of making 3 or 4 long feathers a different color, as well as a few shorter ones different colors as well. Color options for front accent feathers are: Grizzly (only available short), Hot Pink (only available short), Red, Orange, Yellow, Green, Light Green, Turquoise, Dark Blue, Purple, Fuchsia, Cream. Want gold accent feathers? No problem! Want extra feathers to make it full? No problem! Want some peacock feathers to accent the front? No problem! Easiest way is to just let me know what colors and style you want and I'll figure out the rest. :D I can even make it look COMPLETELY different than what's on the photo so if you have an amazing idea I'd love to hear it and make it come to life. I LOVE discussing new feather headdress ideas so don't hesitate at all to contact me so we can talk about it! Most pieces have a small medallion / pendant on the front unless you prefer to have none. Please specify if you would like a custom jewelry silver/bronze/gold based medallion. (won't be real gold/silver/bronze unless you would like to pay extra for the cost) **********If you do not specify, I will make the call on what pendant to select, if any at all. Each pendant is different so I will add whatever I feel looks best but you can always remove whatever I put on it and put one of our own of your own preference. Keep in mind the feather mohawk in the photos is a prototype to what you can do, but the possibilities are endless when it comes to creativity with these! If you want it to be even more custom than this, feel free to let me know. 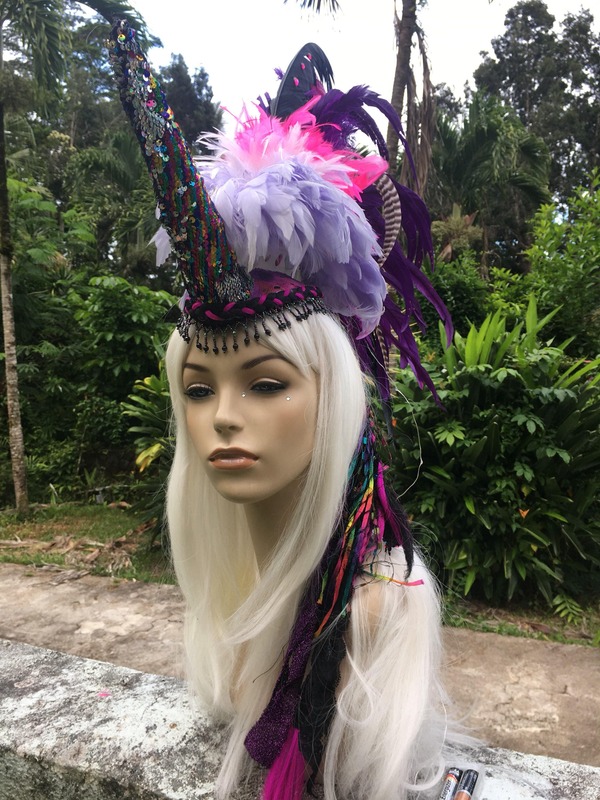 I have had people request everything from all black mohawks, to adding sequins, to head chains, to spray painting the tips of the feathers, so bring on the ideas and I will bring on the creativity! We can discuss via etsy, email, skype or phone - even before you make you make your decision to purchase so that you are 100% comfortable that I'll make something you will be overly happy with and proud to wear - I'll make sure that this piece of wearable art is fully customized so that it fits exactly what you envision and want! CAN I SEE SOME EXAMPLES OF OTHER CUSTOM FEATHER MOHAWKS YOU HAVE MADE? Absolutely, at your request I will send you a photo before I mail it, unless you're not interested in seeing it (so far, most are so excited about their feather mohawks that they can't wait to see photos before they get it!). I want you to be thrilled and excited when you pull your mohawk out of the box. before shipping, I will email you some photos of the exact one you will be getting so that I get your seal of approval! At your request, I can also make a quick video so you can see your mohawk from different angles. I can even skype you so that you see it live. Please note this will take an additional day or two to ship but totally doable. This method is very convenient though because you'll have a better idea of what you will be getting and if you have any last minute requests or changes this will be your chance to speak up! Instructions on how to wear the feather mohawks can be found on my youtube - message me with your email address and i will send you an instructional video. Sorry, I will only share this video to those serious about purchasing, not if you're looking to make one for yourself. Once it's on, you can be rest assured that it will be on securely and comfortably - I've even forgotten that I have it on sometimes! Holds on tightly with a with a banana clip, and hair ties. No headband needed! This is something you can wear to a party and swing your head in any direction without feeling like it might fall off! When it's on, it's ON! I DON'T WANT IT TO FALL OFF OF ME, CAN I REALLY WEAR IT ALL DAY AND NIGHT? If you have 1-2 inches of hair: You can still wear this mohawk - watch the video http://www.youtube.com/watch?v=tvq6Bd4gF9Q, and to add to that, instead of just two hair ties, use three for extra security and make sure you use a heavy gel on your hair (hair glue works wonders!!!) on top so that the mohawk adheres to your head tightly. For short hair I highly recommend using snag free elastic bands. Let me know if your hair is short and I will include them free of charge with your mohawk. I once put a feather mohawk on a gal that had less than one inch hair on a windy day and she said that the mohawk felt very secure on her, so short hair is definitely doable. Bald/ no hair: Because it uses a banana clip, it can be attached to a skull cap or Nylon cap, or even with some adhesive glue. Let me know if you are bald so I can modify the mohawk to fit on your head comfortably. Let's talk about it! Depending on the time of the year, Please allow about 1-3 weeks for me to get it made for you and shipped out so you can rock this baby out on the town, party, rave, festival, carnival, mardi gras, photoshoot, concert, New Years Eve, Halloween - anywhere you want to WOW people and turn heads, this is what you need!!! Feathers arch nemesis is the moth, so depending on where you live, have some mothballs near your feather mohawk while not in use. You may save the bag your mohawk comes in and throw a mothball in it and that should do the trick. If you want to have it out on display, I would just have mothballs nearby or tucked inside of the mohawk when not in use. This is my advice but you don't have follow it obviously. Just keep an eye on your mohawk from time to time to see if moths have gotten to it. I live in Hawaii and also lived in LA prior and I personally have not encountered moths, but from what my wholesale distributor tells me, if moths are around, they WILL eat your feathers. Also, if you want the top of your feather mohawk to remain super tall, do not store it in the bag, you can hang it on the wall with a thumbtack or nail upside down letting the feathers hang, or somewhere where it has room to spread its feathers out. If you like the curved back look to the mohawk, keep it in the bag or hang upright. Feathers are like hair, and will change based on how you store them. You can even curl them with a curling iron or straighten them too! I'VE BEEN WEARING MY FEATHER MOHAWK TO SO MANY EVENTS - BUT IT'S STARTING TO LOOK FRAYED AND DIRTY. IS THERE ANYTHING I CAN DO TO CLEAN IT? I WAS OUT ROCKIN MY HAWK AT AN EVENT AND IT STARTED RAINING! IS IT RUINED??? Feathers can handle just about any weather condition because they were like hair to our winged friends and they got wet for regular showers when they belonged to the birdy that grew them! So if you get your mohawk wet, it's OK! The dyes used in the feathers won't run and once dried the feathers will be back to normal.. Since feathers are like hair keep in mind they will dry exactly how you position them so just be aware of feathers that are out of place while drying your mohawk. If you have a hair dryer nearby you can also just use the hair dryer and that will probably even make the feathers puff out, making your mohawk even more awesome. I have worn my head pieces in mild rain without taking it off and they have been fine. Also please note there is a 'bird' smell that is natural to feathers that you might notice but will go away once they dry. Overall my suggestion is try your best to stay out of any heavy rain, dry it out if it does get wet and you'll be fine!